Recent medical studies have shown hearing loss to be a leading cause of dementia, increasing your risk by 200-500%. By restoring your hearing, however, you can actually improve your cognitive ability, slowing or even preventing the development of dementia. Research funded by the National Institutes of Health also shows that a person with diabetes is twice as likely to develop hearing loss as someone without the disease. Diabetes is a disease that affects many areas of your body, including the fragile blood vessels in your ears. When the blood vessels in your ears become damaged, there is no way for them to receive the blood supply they need to function properly. This results in damaged hearing. When you work with our Rupert, ID, hearing doctors for treatment for hearing loss, we do far more than provide you with a hearing aid. Our audiologists at Mt. 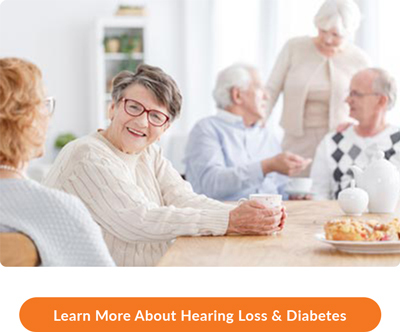 Harrison Audiology team up with you through a comprehensive hearing rehabilitation program that includes activities to improve your cognitive function and ways to help you maintain healthy hearing, even with a disease like diabetes. Don’t leave yourself at risk for dementia or diabetes-related hearing loss – schedule a free real-world hearing consultation with our experienced and knowledgeable audiologists and let us show you more about the incredible link between your hearing ability, your mental acuity, and your overall health. To schedule your FREE consultation with our Rupert, ID, hearing doctors for 5-star-rated care, give us a call at 208.312.0957 or CLICK HERE today. Your new patient consultation includes a review of your medical history, an in-depth discussion of your hearing loss concerns and goals, and an explanation of our process, for FREE. After your consultation, our experienced team will recommend further evaluation and testing, if necessary, and a treatment plan customized to your hearing needs.